Cervical Cancer and Pap Smear Test news and information. A new light based test that detects early signs of cervical cancer may be a better diagnostic tool than a pap smear, according to preliminary findings from a multi-site Food and Drug Administration (FDA) pivotal clinical trial. 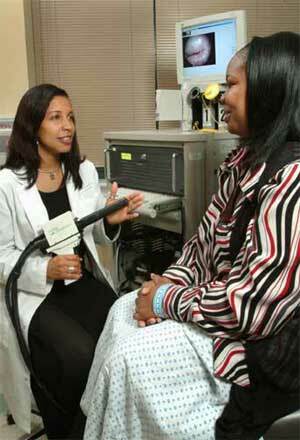 The study of more than 1,900 women looked at Guided Therapeutics' LightTouch system, a device that uses optical probe to shine light at different wavelengths and to detect alterations in fluorescence spectra coming back from the dysplastic /cancerous growth. For cervical tissue reflectance measurements, broadband spectral output ranging from about 350 to 900nm was automatically applied under software control to the cervix using the same xenon arc lamp. The resultant reflectance spectral output from the cervical tissue was imaged onto the CCD camera and stored for processing and analysis. For cervical tissue fluorescence measurements, light from the arc lamp was band pass filtered to limit exposure of the cervix to bands within the 300 to 500 nm range. These spectral bands are known to excite fluorophores associated with neoplastic processes as described above. Each of the fluorescence wavelengths were applied automatically under software control in a predetermined order and scan pattern. The resultant fluorescent spectral output of the cervical tissue was imaged onto a charge coupled device (CCD) camera and stored for processing and analysis. The system consists of two main physical components, the hand-held unit and the base unit. The handheld unit is connected to the base unit via fiberoptic cables for transmission of light to and from the base unit, which contains the xenon arc lamp, optical processing elements (e.g., filters and lenses) and the CCD camera on a rolling cart (CNDS Device).